Are oysters the seafood Viagra? This is the next to last of the oysters as aphrodisiacs series started in January, with blogs on oysters as a source of global pleasure (Jan 28), the Jan 28 post on oysters as iconic aphrodisiac, which addresses the dopamine hypothesis, the post on the D-aspartic acid and NMDA hypothesis that "Eating molluscs increases the release of sexual hormones in humans" and increases desire and subsequent sexual activity/bivalve hypothesis, and the zinc-virility hypothesis, today's topic. Tomorrow's post is conclusionary,and considers all aspects of the claim for oysters as aphrodisiacs, including visually and imaginatively sourced influences. The zinc for male virility hypothesis posits the claim that eating oysters increases male virility. Virility can be interpreted broadly, as maleness, which usually includes strength, vigor, sexual desire, and sexual performance, or more narrowly, which requires sperm capable of reproductive ends, that is, no blanks. The zinc hypothesis is the real deal: good science, based on how nutrition affects bodily functioning, including male sexual performance. The primary nutrient basis for this claim is that a serious zinc deficiency has been linked with impotence, and oysters are among the highest food sources of zinc. This claim is well supported by one simple fact: the body requires certain chemicals, 60 or so, to function. Some of the most common are oxygen, carbon, hydrogen and nitrogen. Zinc is a trace mineral, required in relatively small quantities, nonetheless critical. Over 80 minerals are required by the human body for optimal functioning. Chemicals are elements or compounds of elements. Some can be synthesized in the body, in varying amounts, but not necessarily sufficient for normal functioning, and others must be acquired from diet, either entirely or supplementary to what the body can synthesize. Essential nutrients are chemicals required by the body for normal functioning that must be obtained from food sources: vitamins, minerals, proteins, carbohydrates, fats (essential fatty acids), water and oxygen. The element oxygen, as one example of a chemical required for functioning, is taken into the body by breathing and drinking water or from foods containing water (H20). Calcium is acquired through food. Nitrogen, critical to the formation of amino acids, which are the basis of proteins and cells, is found in many organic molecules, including the amino acids that make up proteins, and the nucleic acids that make up DNA. Foods called complete proteins provide the body with all the essential nutrients, among which zinc is important especially for reproduction, but also for best functioning by systems such as the immune system. Some categories of essential nutrients include vitamins, dietary minerals, essential fatty acids, and essential amino acids. 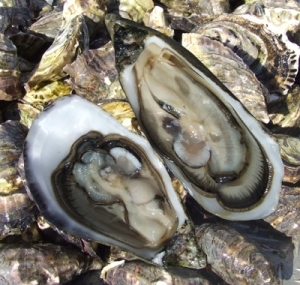 Oysters supply both essential nutrients and also chemical componds esentail to critical systems such as the dopamine-seeking/motivational system, as considered in the post on the dopamine hypothesis. Oysters are complete proteins, providing all the essential nutrients that can be supplied by proteins and one of the best if not the best food sources for zinc. A dinner-sized serving of 10 raw oysters provide 55.13 mg of the essential nutrient zinc, or about 100 mg per gram of raw oyster. This is more than the minimum required by either men (11 mg) or women (8 mg.). Both men and women need to acquire zinc through diet. Zinc is needed by males for both healthy prostate glands and also to replace seminal fluid. Evidence also supports the need for zinc by women for both reproduction and mental function, and since zinc is not stored, pregnancy in particular increases a woman's need for zinc. Foods high in zinc affect the following, all of which affect sexual activity: Zinc helps balance blood sugar; Stabilizes metabolic rate; prevents a weakened immune system; Support optimal sense of smell and taste. The first research studies to demonstrate zinc's important in the diet focused on the issue of growth. When foods did not supply sufficient amounts of zinc, young men in Iran and Egypt were found to have impaired overall growth as well as impaired sexual maturation. These initial studies on zinc reflected some of the key functions served by this mineral, including regulation of genetic activity and balance of carbohydrate metabolism and blood sugar. To sum above the above: evidence supports the zinc hypothesis. Eating sufficient amounts of raw oysters increases zinc in humans, which in turn supports functions critical to the concept of male virility such as sperm production. The next post sums up all the evidence, science and folk, for claims that oysters are aphrodisiacs, just in time for a Valentine's Day menu.